Historian Niall Ferguson gives insight into the symbiotic relationship between America and China, "Chimerica", and the role this delicate balance plays in financial globalization. Financial globalization has led to an interconnected monetary climate, but this has also led to a vulnerability from financial instability and vulnerability from unstable political forces. Professor Niall Ferguson examines the financial innovations that have led to the dependence of American burrowers on Asian savers. 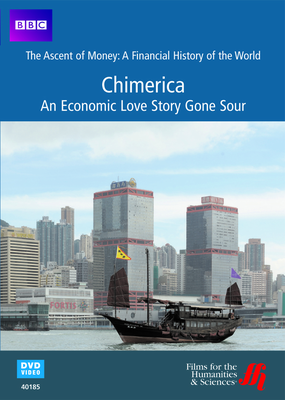 Ferguson calls this symbiotic relations "Chimerica" and discusses its role in financial globalization. Ferguson explains how emerging markets are no longer considered the riskiest investment; however, there are issues with foreign investment. Investors are not as connected to the markets and may not know of potential issues until after financial ruin. The problem is how do foreign investors ensure these corporations function as expected? Niall Ferguson explains this complex relationship by taking viewers around the globe to visit trading centers in Hong Kong and Chongqing, China--along with the International Monetary Fund and World Bank. Produced by BBC Worldwide, this is part of the series The Ascent of Money: A Financial History of the World.